These Taco tanks are designed to solve a long-time problem in the hydronics industry. In old style, plain steel tanks, the direct air-to-water interface can allow the air to be absorbed into solution and carried to other parts of the system. The results can be waterlogged tanks, air-bound terminal units, excessive corrosion, inefficient balancing and pump cavitations. Not so with Taco CA Series Tanks. In this design, the air is held captive on the shell side, with all expanded fluid directed into the bladder (in CA models) or the diaphragm chamber (in the CX Series). Air and water are permanently separated, so no absorption can take place during the system cycle. Properly sized, selected and located air separation and removal components can provide a stable, tight and closed hydronic system. 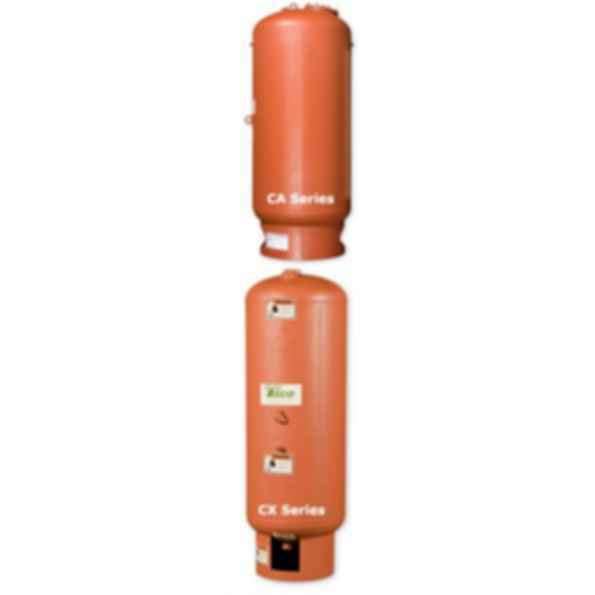 In most properly-sized CA systems, you can reduce the tank size by 80% compared to the old style, plain steel tanks. Limited Acceptance DesignFor small heating installations and most chilled water applications where smaller air volumes and expanded fluid volumes are needed. CAX Series Tanks have been superseded by Taco CBX Tanks.